Sports Trips has everything you need to build and customize your own Detroit Tigers Travel Packages. Experience the MLB with the greatest fans in the American League Central. Nothing beats a Detroit Tigers Game! Sports Trips is your #1 resource for all of your Detroit Tigers Home or Away Tickets, Flights, Hotels near Comerica Park. Start booking your trip now! The District in Detroit is one of the largest sports and entertainment developments in the country. Located in the heart of Detroit. Enjoy Premiere seats, hospitality & more! Watch the Detroit Tigers Play Live. Get Your Tickets Today! Planning your Detroit Tigers Trip? Here is where you are going to find the best Detroit Tigers Travel Deals so you can make your budget stretch as far as possible. Whether you Love American Airlines or can’t get enough of JetBlue, we’ll help you find air travel deals for away games or to DTW and let us help you Book Cheap Airline Tickets on most carriers. We provide you with Hotels that are walking distance from Tiger Stadium and most MLB Venues. Comerica Park is located in Detroit, Michigan and is home to the Detroit Tigers. The major-league baseball season has always been defined by the sport’s history, great fans, team competition, and state-of-the-art stadiums! Sports Trips provide comprehensive Travel Packages both domestically and internationally. Book now and get great rates for all MLB Destinations with, VIP, Premiere and General Admission Tickets, Flights and Hotels. Book and build your customized Detroit Tigers Travel Packages today for a remarkable price!! SEE IT LIVE! Comerica Park is located in Detroit, Michigan. It is the home of the Detroit Tigers. Sports Trips is your source for a complete listing of hotels & Resorts closest to Detroit Tigers. offering you the best rates on Comerica Park Hotels. Are you making restaurant reservations? Would you like to do it the easy way? OpenTable makes it easy to make restaurant reservations the easy way. Beat the crowd and make your reservations in Detroit now. Read reviews, explore menus & photos. Make restaurant reservations & find the perfect spot for your Detroit Tigers Game Day weekend. OpenTable to make your reservations today! Checker is the oldest and largest livery company in Michigan with 400 local and state licensed vehicles servicing in excess of 12,000 passengers daily in metropolitan Detroit. There is always a Checker nearby to service all your transportation needs 24 hours a day, 365 days a year. Checker utilizes a state-of-the-art dispatch system that includes automated trip booking for repeat customers and wireless computers in each vehicle equipped with GPS and turn by turn directions ready to service you in a moment’s notice. This technology allows customers the choice of booking a trip through the automated dispatch system or directly with a customer service representative. Wherever you’re headed in the Detroit Area, count on Lyft for rides in minutes. The Lyft app matches you with friendly local drivers at the tap of a button. Just request and go. After the ride, simply pay through your phone. Detroit Airport Limo & Transportation Service is Detroit’s most prominent limo company with the newest and largest fleet of luxury town car, stretch limousines, SUV’s & Vans in Detroit at your service 24 hours a day, 365 days per year. Metro Detroit Party Bus has been called the number one party bus service company in our area. We provide our great luxury services all over Detroit and far beyond with the kind of class and flair that no other company can provide! If you are not familiar with a party bus then let us explain – think of a limousine, but without the cramped space. Our party buses have the luxurious feel of a limousine with hardwood floors and custom wrap-around leather seats, but and with many more entertainment features like large flat screen televisions, dance poles, colorful accent lighting, and built-in bars! Use I-90 east toward downtown Cleveland; continue on the Innerbelt (I-90) east to East 9th Street; exit onto East 9th Street heading north to Ballpark area parking. Use I-90 east toward downtown Cleveland; continue onto I-490 east; take the ramp for I-77 north; take the East 9th/Ontario Street exit; follow signs to either East 9th Street north or Ontario Street north to Ballpark area parking. Take SR 2 east toward Downtown; exit onto West 25th Street, turn right on West 25th Street; take the first left to cross the Detroit-Superior Bridge; turn right onto W Huron Road to Ballpark area parking. Take I-90/SR 2 west toward Downtown; exit at East 9th Street; turn left onto East 9th Street and head south to Ballpark area parking. Take I-77 north; take the East 9th/Ontario Street exit; follow signs to either East 9th Street north or Ontario Street north to Ballpark area parking. Take I-71 north to the Innerbelt merge; continue on the Innerbelt (I-90) east to East 9th Street; exit onto East 9th Street heading north to Ballpark area parking. Take I-71 north toward downtown Cleveland; take the ramp for I-490 east; take the ramp for I-77 north; take the East 9th/Ontario Street exit; follow signs to either East 9th Street north or Ontario Street north to Ballpark area parking. 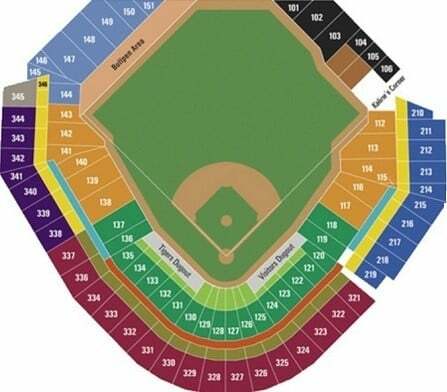 Sports Trips has up to the minute Detroit Tigers Tickets, Flights, and Hotel Information. Start planning your trip Today!